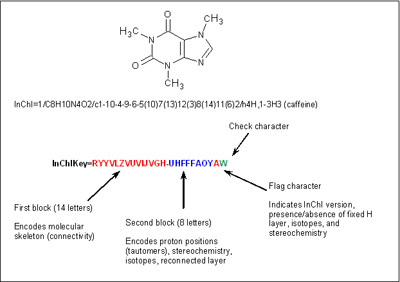 On 5 September 2007, IUPAC announced a new beta-release of its International Chemical Identifier (InChI) software. The Identifier is an open source, non-proprietary, unique, machine-readable structure-based identifier for chemical substances that may be used in printed and electronic data sources, providing an easier way to link diverse data and information compilations. An example of InChI, with its InChIKey equivalent, is shown on page 19. There is a finite, but very small probability of finding two structures with the same InChIKey. For duplication of only the first block of 14 characters this is 1.3 percent in 109, equivalent to a single collision in one of 75 databases of 109 compounds each. Another new feature of this release is a restructured InChI-generating software that separates key steps in its creation from an input chemical structure file. Among other uses, this allows intermediate results to be checked, enabling easier testing and development of InChI-based applications. The new release may be downloaded from the IUPAC website <www.iupac.org/inchi>. Users are encouraged to report their experiences, or problems, make comments, and request additional information by contacting the InChI project coordinator Alan McNaught, at <mcnaught@ntlworld.com>.